Devoted Quilter: Of Course He Cried! I began taking the Bible seriously thanks to Chuck Swindoll's teaching on Insight for Living. One of the biggest things that changed my thinking was Chuck's habit of saying, "I wonder what he was thinking when that happened." Or, "I wonder how he felt at that moment." It made me realize Bible people were real people. They aren't just made up characters in an old book - they really lived and did the things recorded in that old book. Their thoughts and feelings didn't always get recorded, but they still had the thoughts and feelings. Imagining how I would feel in certain situations helps me relate to the Bible stories. Relating to what I read helps keep me from just reading it in an offhand manner. Instead I enter into it, think about it and try to learn from it. Here is the NIV translation of Luke's account of the birth of Jesus. So Joseph also went up from the town of Nazareth in Galilee to Judea, to Bethlehem the town of David, because he belonged to the house and line of David. He went there to register with Mary, who was pledged to be married to him and was expecting a child. While they were there, the time came for the baby to be born, and she gave birth to her firstborn, a son. She wrapped him in cloths and placed him in a manger, because there was no guest room available for them" ( Luke 2:1-7). There's not a lot of thoughts or feelings recorded there. On top of that, I think some of our Christmas carols have done us a disservice when it comes to relating to the Christmas story. Don't get me wrong, Christmas carols are beautiful, but I think some of them are a little off the mark. Take 'Silent Night' for instance. I doubt Bethlehem was all that silent that night. The town was so full of visitors there were no rooms available anywhere. Just imagine all the noise and confusion that would come from having that many people uprooted and forced to travel. Remember, these people were not on vacation because they wanted to get away from it all. They were told they had to go, like it or not. I would imagine more than a few of them didn't like it much at all. And just imagine how many donkeys were being housed in the stable Mary and Joseph were offered for the night. Imagine all the sounds - and smells - that would accompany those donkeys. Kind of goes against all the pretty Christmas scenes, doesn't it? And yet, doesn't it also feel more real, more understandable? Our world is not perfect. There are messes all around us, both literal and figurative. But Jesus willingly came into our messy world and He can help us deal with whatever mess we make of our lives. When Aiden was a baby, Paul asked me one day, "Do you think Mary ever said, 'Jesus, would you please just go to sleep?'" It really made me stop and think. 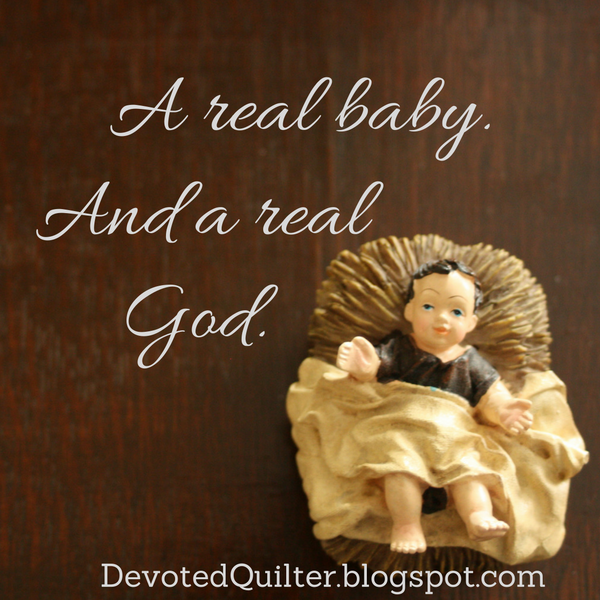 Jesus was sinless, fully God, but He was also a human baby. Babies have trouble falling asleep. They cry. There's nothing sinful in that. It's a baby's only way of communicating. I find I can't relate to, or even really believe in, a baby who doesn't cry, as 'Away in a Manger' says of Jesus. Of course He cried! How else did Mary know when He was hungry or cold or scared? Jesus did baby things, like crying, teething, falling down and learning to walk, even though it isn't recorded in the Bible. Over the next few weeks, try imagining your way into the Christmas story. Set aside the sterile, silent version and really think about the events, the circumstances and the people. Think about a God willing to step into our messy world, our messy lives, and become a helpless baby dependent on a human mother. A real baby. A real mother. And real Saviour! Great devotion, Leanne! Merry Christmas!